We know they had a camera, because they took interior photos (hoo boy did they take interior photos) in this listing that Stuart found. And yet this is the exterior shot they think will draw in the buyers in this market. I am... am... well, I'm not a real estate agent, what do I know about selling houses? Bupkis. And that is why I'm not trying to sell a house. It would be good, I think, of more people paused for a few seconds of self-reflection before starting a business transaction that will run into hundreds of thousands of dollars. "Do I know anything about selling a house? No? Huh, so maybe I should find someone who does." I know! I know! Isn't this home in Pleasantville? I love this house! Once all the stuff is removed I'm sure it would be fabulous. do the 2 ladders and one stepladder outside come with the place? I think they lend the back balcony a certain air of.... needing to be painted! hubby noticed that there are no pictures of the floor - can we all say CLEAN HOUSE together now? ick!! 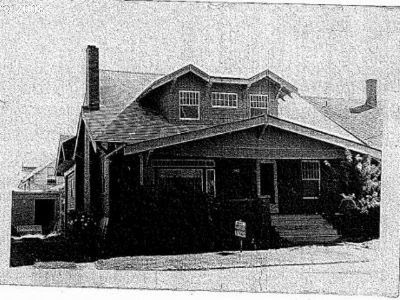 Anyway, best guess in that this b/w pic was taken from the micro phish from when the now-owners were purchasing this house. Sadly the black and white exterior pic is the most flattering of the bunch. eeee crap is hanging from every possible surface in this house and the photos are so close up it takes a minute to figure out what you're even looking at. It totally looks like a slightly more cluttered "Ugly Betty" house! Um, is that a lithograph of the house? Cuz that would be cool. I almost thought that the B&W shot was an old catalog picture proving that it was a Sears Kit house, because that would be a selling point. Except that there's a for sale sign right in front. Maybe it's from the newspaper listing when they bought the house 20 years ago. OMG, that is actually a cool old house. If i were the realtor at the price of that listign I would take boxes over and label and move and pack for about 8 hours. The return on investment would be great. Get rid of MOST of the clutter and clean up all the woodwork with Murphy's...and TA DA you have just earned your commission! If I lived close by I would go and pack it up for free, b/c the elderly people might be less ill if they could move around and breath fresh air. Just a thought! This made me so sad. I think they're trying to show the detailing of the woodwork. Maybe some of those people whose photos are on the fireplace could come help their elderly relatives have a clear up and take a few decent photos. I'm going to write a card to my Grandma now. I love the random photos of corners and display cases and whatnot. WOW, your troll really seals the deal! I MUST have this house! wow. who decided it was okay to take these photos without cleaning. what a mess. i love the 2 pics of the ceiling. what's the point of that? Okay, is it just me, or does "Owners elderly and ill. Need time." creepily suggest a deathwatch? Aww, "owners elderly and ill". :( I noticed that all of the interior pics are taken from extremely close range...as if, everything has closed in on you so much you can't back up and take pictures from the other side of the room. And I also think that exterior photo might be from when they bought the house originally. It looks like someone is very, very proud of the woodowork in their home. C'mon, it's a house in Portland. Having that much schmutz all over everything just makes it easier to convince the cops that the new owners aren't turning it into a grow house. It makes my eyes hurt!! I kept wondering if the contents of this house would be a goldmine on Antiques Roadshow... or just the subject of another funny ebay commercial. I always wondered what my house would look like if I never threw anything away. Now I know. I'm really hoping they have an estate sale/open house, something that's not uncommon here in Portland. They're super-fun: not only do you get to see inside the house (which in this case looks like a classic PDX house), but you get to see the YEARS of stuff they've accumulated by NEVER getting rid of ANYTHING. EVER. I agree with cottagecheap- the realtor would do him/herself a great service to go over & clean it themselves- maybe with a LOT of help. And respirators. I think the B&W photo is meant to obscure the BRILLIANT TURQUOISE color of the trim. Seriously, that is a beautiful house in a good neighborhood. Repaint and refinish the wood and it's gorgeous. 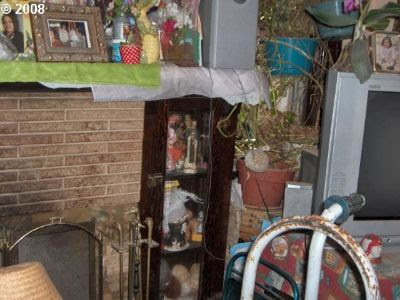 It's a little sad, though, to see so many houses stuffed to the ceiling with 40 years of Grandma's junk. I picture my mom's house and 6 rooms of cat figurines. After the funeral, Goodwill's going to need to send a cargo freighter. My personal favourite is the count-the-ladders photo of the back of the house. I personally found the scorch marks above the fireplace really scary ... that is one house you do NOT want to start a fire in. Hey, it's elderly, ailing owners who are probably making a $300k profit or more on the house from what they bought it for. That's a relatively expensive, recently gentrified area of Portand. For people who are looking for a Craftsman house, those pics do the job - unpainted original woodwork, lots of built-ins, sweet! Front must either need a ton of work or is just totally obscured by overgrown shrubbery. Agent would probably lose the deal if she/he tried to get them to clear out the detritus of their clutter-collecting lives before the sale.